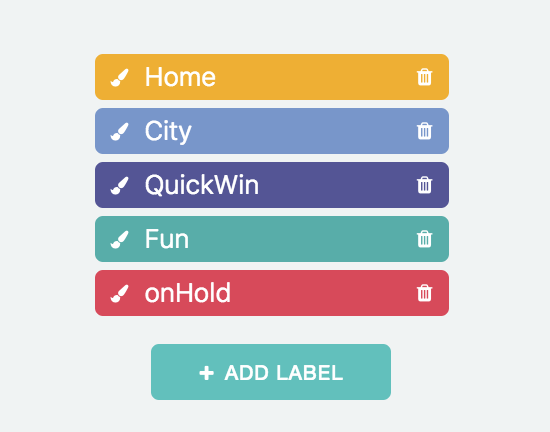 Labels and tags are a to-do app basic. They allow you to add extra information and categorization to any task. In Marvin, labels are a strategy, so make sure the strategy is turned on if you want to use labels/tags for your tasks and projects. Where can I use labels? Labels can be added to tasks and projects. "Tweet out new tool @QuickWin"
After pressing enter to commit the title edit, the @QuickWin will get turned into a label that appears underneath the title. If the label does not exist yet (is not used anywhere else yet) it will create the new label for you. Alternatively, you can also add labels via the edit icon (cog). How to remove labels from tasks and projects. To remove a label go to the edit dialog (via the edit icon that looks like a cog on the right) and then click the little x on the label. To see all the labels that are currently in use, go to the strategy card, open it (by clicking it) and then go to "settings". There you will see a list of all labels you have created. You can delete them here and they will get removed from all the tasks and projects. To change the color of your labels, click on the paintbrush on the left of the label in the strategy settings. It will change the color of the label everywhere. You can choose to have your labels show up as colored text underneath the task/project title or as a colored tag. To show them as tags, click on the checkbox underneath the label list in the strategy settings. If you have a task with a label in your day view and want to quickly only see tasks with that label in your day, hold shift and click on the label to create a filter with that label.